Published on January 29, 2013 in analytics. Closed Tags: Boston condo sales, Boston real estate, Boston sales outlook, Boston sales volume, Boston South End condo sales, downtown Boston real estate, South End condos. Lack of Inventory remains the challenge. The Big Number is 23%. Combined, all Boston neighborhoods saw a 23% increase in the number of condo sold in 2012, from 3,544 sales in 2011 to 4,361 sales in 2012. The average sales price of condominiums increased 5% to $563K from $536K in 2011. The median sales price increased 8% to $410K from $380K in 2011. This real estate market is healthy except for the continuing decrease in inventory levels. The number of condominiums for sale in downtown has dropped 46% to 565 from 1050 last year at this time, and that was an extremely low number! The Back Bay, saw a 24% increase in sales to 537 units from 433 in 2011, while the average price of a condo sold increased by 5% to $1.18M. The number of condos available for sale dropped 49% from 158 last year to only 80 today. The South End saw a 9% increase in the number of condo sales to 540 condos sold year to date compared to 497 last year. The average price of a condo sold increased 6% to $704K compared with $663K last year. The inventory of condos for sale decreased 30% from a very low 91 last year to a terrifying 64 today. The dearth of inventory is the issue going forward. 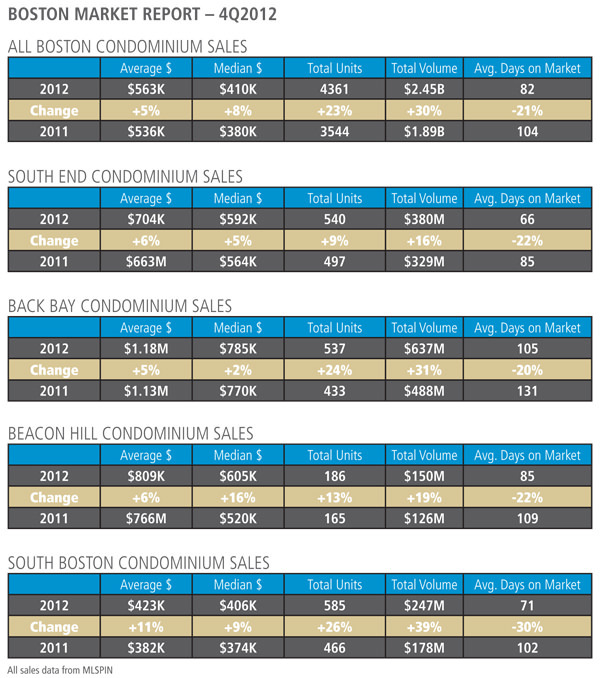 South Boston saw a 26% increase in the number of condo sold to 585 in 2012 compared with 466 in 2011. The average sales price of a condo increased by 11% to $423K compared with $382K in 2011. South Boston has the largest drop in inventory of all downtown n’hoods down 72% from 141 properties for sale on this date last year compared to 39 available for sale today. Inventory remains the problem, but as I have said repeatedly this market is so resilient and so desirable that declining inventory levels have not negatively effected the steady increase in sales and prices. Time will tell if this dynamic continues.